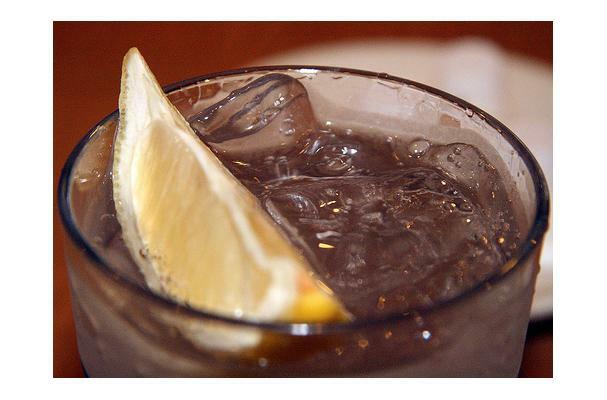 Club Soda is a type of carbonated water with a slightly salty taste. Club Soda is mixed with other drinks or added to recipes to make fluffier cookies, cakes, pancakes and waffles. It is also useful around the house for cleaning porcelain sinks and fixtures and removing stains from fabrics. Water that is carbonated and made effervescent. Choosing: Look out for club soda in cans that are leaking, rusting, bulging or severely dented. If it develops an off odor, flavor or appearance, discard right away for quality purposes. Procuring: Club soda could be identical to plain carbonated waer or it may contain a small amount of table salt, sodium citrate, sodium bicarbonate, potassium sulfate, or disodium phosphate, depending on the bottler. In the UK Soda Water is nearly always ade with sodium bicarbonate. The process can also occur naturally to produce carbonated mineral water. Soda water is often drunk plan, mixed with fruit juices and is used to dilute alcoholic beverages an make cocktails, such as a whisky and soda or Campari and soda. Can be used in cleaning iron pots and pans, red wine spills on carpet, car supplies and precious gems like sapphires, rubies, emeralds and diamonds. Can also be used to calm an upset stomach. Storage time shown is for best quality only - after that, its color and flavor may change, but in most cases, may still be safe to consume if it has been stored properly. History: In the past, club soda was produced in the home by charging a refillable seltzer bottle by filling it with water and then adding carbon dioxide. Club soda was first sold in North America in the late 1700.